My bet is it started with the mainstream success of The Secret. Almost overnight, even your straight-laced neighbor was commenting on how if you want something — anything, all you have to do is manifest it! Easy as huckleberry pie… too bad it’s a lie. Now I’m not saying you can’t create what you desire, diva. Believe me when I say: you have so much more power than you know. But the countless so-called ‘experts’ telling you that desire by itself is enough — they’re not giving you the full story. Remember playing the game telephone as a kid? You whisper something to the person next to you, they whisper it to the person next to them, and it goes on until the message comes back to the original person. What might have started as “the dog ate a shoe” can quite easily turn into “the hog did a poo”, am I right? 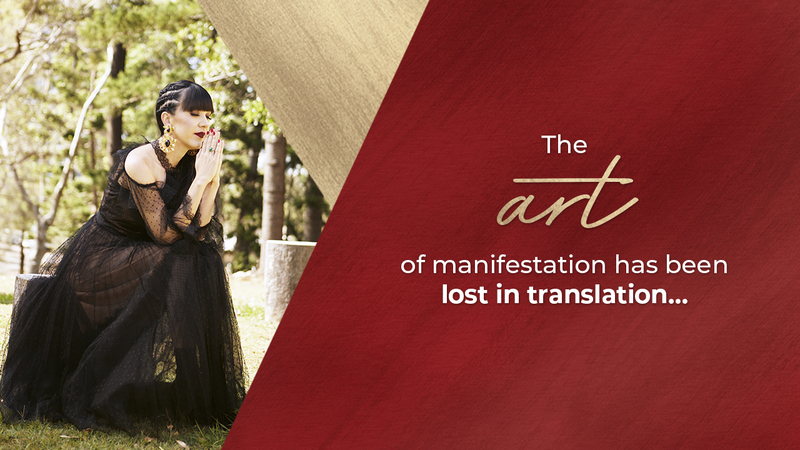 Well, the same thing has happened with teachings on manifestation. The internet is exploding with articles on how to manifest mansions and Maseratis and almost all of the advice is some version of the messed up phrase at the end of the telephone game. First off, they don’t acknowledge that everyone is already manifesting all the freaking time! You are a creator, whether you know it or not. You can create consciously or unconsciously and it’s this seemingly subtle shift that makes all the difference. Yep, even the crap, pain, struggle, toxic relationships, and the sad looking bank account all come from creation. But when you create consciously, you give yourself a powerful tool to attract more of the good stuff. The juicy abundance, heart-centered drama-free relationships, and easy joyful vibes. 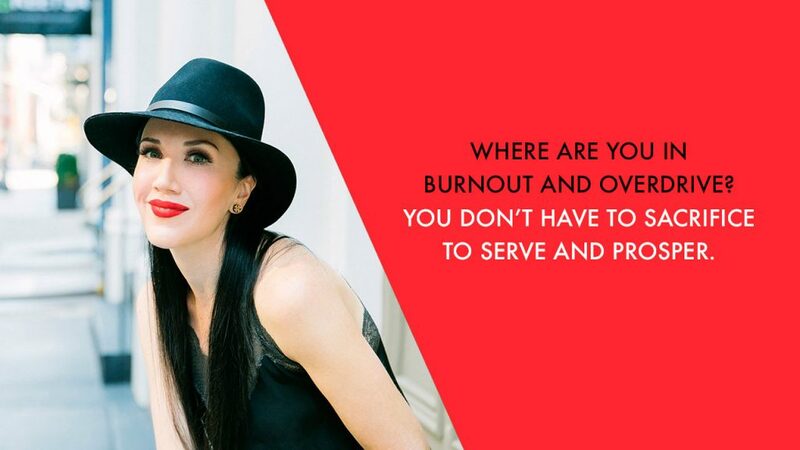 Visualizing a walk-in closet full of Jimmy Choos isn’t enough if the rest of your day is spent feeding energy vampires or resenting your life. The second manifestation myth is that it’ll always be easy. Nobody tells you what to do when you inevitably try to sabotage your own dreams from coming to fruition. I don’t say inevitably to sound like a downer, I say it because society’s self-defeating imprint on our psyches simply cannot be ignored. I’ve never read a how-to guide on manifestation that left me feeling connected to my creatrix femme power. Let’s break down the walls, the illusions, and the half-truths you’ve been told about manifestation so you can freely create all that you desire. I’ll show you how with a simple and powerfully effective 2 step process. 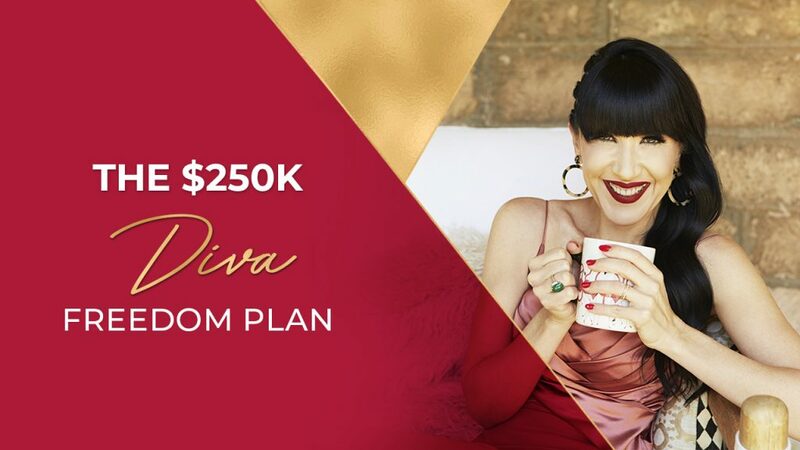 Glorious divas ready for massive change join my programs and pay thousands for what I’m about to teach you for free. Set the intention right now to take ACTION on what you’re about to learn and excavate yourself from poverty consciousness. In order for you to GET what you want, divine woman, you need to KNOW what you want. Mmm, easy-peasy you say? Not so fast pussycat. You might think you want a drawer full of diamonds, luxurious spa days, and a 5-star personal chef at your fingertips, but what you really want goes deeper than those things. Underneath all of your desires is a feeling. Ask your soul, your spirit, your divine feminine essence to show you what you truly desire. Not what society deems appropriate. Not what your ego thinks you want. Get laser lucid clear on your deepest desires. Don’t skip this step, diva. If you’re not clear on what you want, you run the risk of manifesting things you don’t want. It’s like sending out a signal that’s pointing to Jamaica when you really wanna go to NYC. You might end up lighting up the joint, but you can only blame yourself if you get stuck in the haze. The truth is most people only have a vague idea of what they really want. They let society dictate what’s possible for them. Not you, goddess. Not anymore. It’s equally important to remember the inherent power of your focus. Where your mind goes, energy flows. When you pay more attention to what you don’t want than what you do — you zap your creatrix power and get stuck in the same cycle of endless struggle. Believing you can manifest beyond your wildest dreams is a practice in and of itself because it requires you to shift your vibration from lack to gratitude, trust, belief, and intention. That’s no easy feat when it feels like everything around you has gone to pot. When I lost my business 5 years ago due to fraud, you bet your behind I felt like a good for nothing waste of space. I was surrounded by people who’d watched me crash and were certain I’d drown. When you have no money and someone’s literally stolen everything from you it’s so damn easy to play the victim. I could’ve easily stayed in that energy of dark desperation, but I knew as I know now that in order to break free I had to become the embodiment and frequency of that which I wanted to receive. I ended the cycle and put a stop to the patterns perpetuating my own suffering. How? 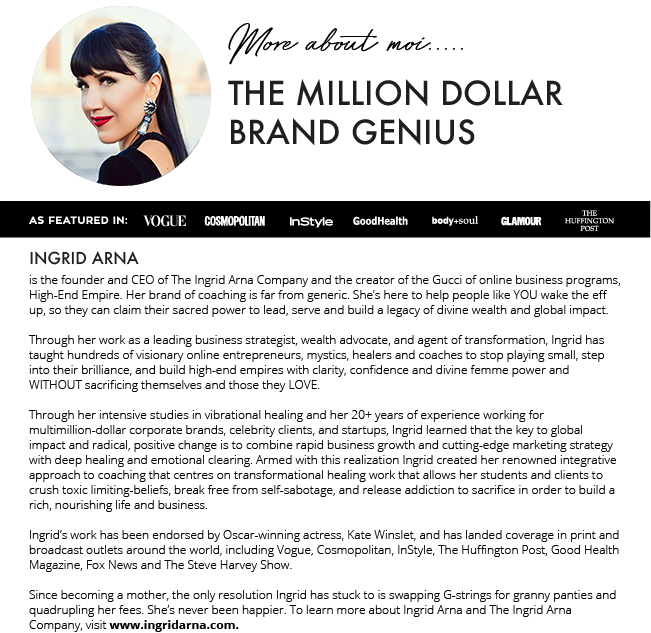 By turning up the volume on what I WANTED to create, on the frequency I NEEDED to embody to create the joyful, abundant, and mission serving million dollar business that I have today. But believe me diva, I was flooded with so much fear. At times, it was like living with constant PTSD. If you’re in a similar situation now, I’m sending you so much love, gorgeous. I know it isn’t easy. I’d harass my poor husband every single night because I was dying for outside affirmation that I could do this. Some days I’m surprised he didn’t leave me, but I know he saw what I didn’t… a divinely powerful woman who was damn well going to get what she set her sights on. I had to pick myself up and get back in touch with my inner creatrix, even if it meant starting from scratch and forgiving the people who screwed me over in the past. More importantly, it meant forgiving myself and remembering who I really am… who we ALL are. When we’ve been through a lot of trauma, pain, or suffering, we forget how powerful we truly are. Returning to your creatrix power is a process of remembrance. It’s a process that calls you to clear the fog surrounding your energy simply by remembering and reminding yourself that YOU ARE THE LIGHT! You are not broken. You don’t need to be fixed. You just need to remember how powerful you are in this moment, no matter your circumstances. It’s through this process and constant reminder of my inner power to create my reality that I was able to heal my body. At my lowest, I had a benign tumor in my ovaries, blood poisoning, and crushed fallopian tubes. The doctors wanted to take out my fallopian tubes. They told me I’d never have the child I so deeply wanted. It felt like a life sentence that I had no say in. And you know what I said? Eff that. I could’ve let them stand sovereign over my body and my life but I chose to shift my frequency, tune into my creatrix power, and HEAL. I conjured up all the faith I could. I poured so much love into my body. I chanted, prayed, and believed in my body’s ability to heal. Two months later, I went back to the doctor and my ovaries were no longer blocked and shriveled. Except they said I still wouldn’t be able to conceive. Again, I didn’t let a stranger tell me what my body, what SPIRIT, what the divine feminine herself, is capable of. I went out and bought beautiful baby clothes. I put them up on my walls where I would see them every day, reaffirming my faith in the divine and the power of my creatrix spirit to transform the impossible into reality. Two months later, I was pregnant and we had a healthy baby girl. Everything you’re wanting to manifest right now first starts as an energy, a vibration, and then it comes into the physical when you love it enough and hold faith closer than your greatest lover. The desire to fall pregnant started with an intention and a deep-seated honest belief in my own powers. One of the biggest mistakes we make on the manifestation path is letting go of faith before our vision has had a chance to show itself in our physical reality. When you want something, you need to plant a seed and nourish it like you would a precious heirloom tomato plant that your family was dependant on for sustenance. When you plant a seed, you don’t doubt that it will eventually sprout if you give it enough love. Your intentions, your vision, your DREAMS are no different. Keep watering them. Keep shining the light of your awareness. Don’t allow fear and lack to contaminate your fertile soils. If you go wandering off into the land of doubt and discontent, be vigilant. Light some incense and burn through that stinky thinking. Bring yourself back to a place of presence. Refocus your attention on your deep desires. Tune into your inner creatrix and the divine feminine that lives within you. I’ve seen too many divine women disown their gifts and sabotage their success all because they didn’t love themselves enough to raise their own abundance ceiling. One of my client’s, Abi, recently made $56K and then said to me that she couldn’t possibly make any more. That was her limit and she was energetically blocking herself from allowing more. When you become a proficient manifestor, you also have to get good at breaking through your abundance threshold and expanding your ability to RECEIVE. The only way to become a master manifestor and clear money karma drama for good is to consistently invite deeper consciousness into your life. That’s how you shift your vibration and shower yourself with every desire you’ve ever dreamed up. Repatterning your default programming without the help of a qualified developer is a slog. It’s possible, but it takes ages (trust me, I did it). That’s why I created The Million Dollar Diva membership themilliondollardivas.com. 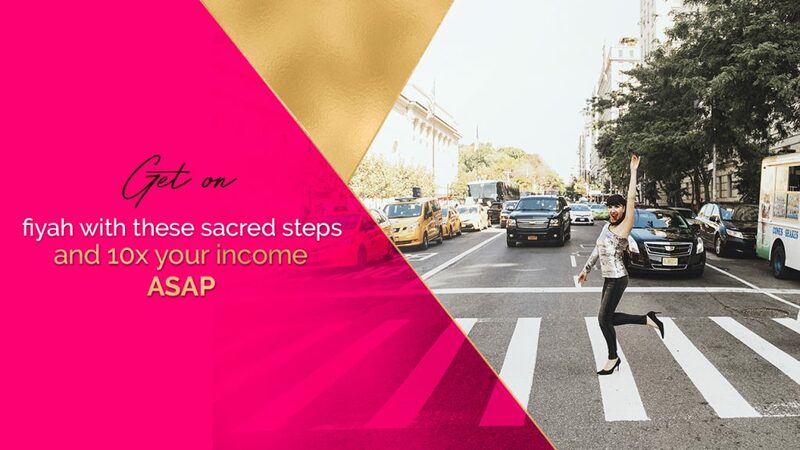 This powerful virtual temple is changing lives and empowering hundreds of divas like you to remember who they really are. To attune to their creatrix power and RISE into riches with sublime grace and ease. It’s the most accessible form of my teachings I’ve ever unleashed and I did it because my mission is to accelerate the planetary shift already taking place — where women honour their creatrix power and transform the world doing it.